Anoop Sebastian (29) and Juby Joseph (27), both hailing from Kerala’s Kannur district, tied the knot last Monday. Hours after the wedding function, the couple was shattered to see messages on social media that bodyshamed Juby and mocked Anoop for marrying a “48-year-old woman with an eye on her wealth worth crores’’. The couple was so upset with the messages that they had to be hospitalised for two days. With the mental trauma persisting, they have been admitted to a meditation centre since Saturday. On the basis of a complaint lodged by parents of the couple, police have arrested 10 people, who allegedly posted or shared the offensive messages. Anoop, employed at Ludhiana airport, and Juby, who works with a firm at Sharjah, hail from neighbouring villages in Kannur and have known each other for years. Anoop’s father Babu Sebastian said, “The flow of humiliating messages started Monday evening soon after they returned home from the church after the marriage. There were vulgar messages too,” said Babu. A photograph of the couple published as an advertisement in newspapers was circulated with the offensive messages. 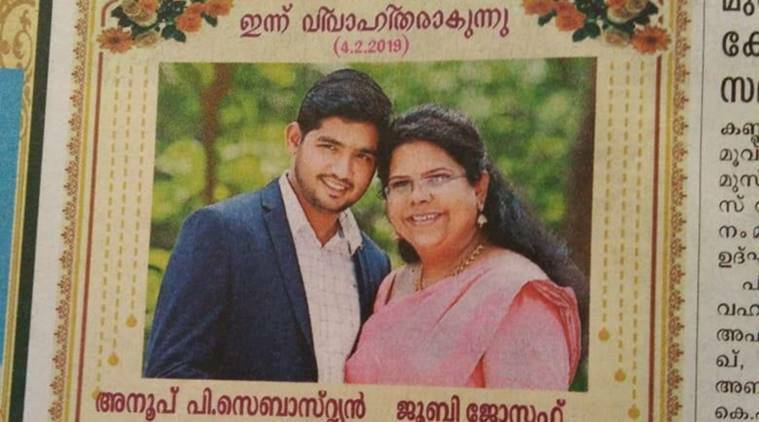 While the advertisement did not mention their ages, captions in Malayalam on the online posts read, “25- year-old man who married 48-year-old woman having an asset of Rs 15 crore’’. Babu said that as the offensive messages kept pouring in, he advised the couple to switch off their mobile phones. “Many persons came home and asked about it. Even our friends and relatives did not spare us. At one stage, I too had to switch off the phone and leave the house,’’ he said. Police said they have arrested 10 people and most of them had shared the messages. While Babu suspected a conspiracy to tarnish his family’s image and hurt his catering business, investigating officer V V Latheesh ruled out a conspiracy. “We are looking to identify administrators of groups and others who shared the messages. The messages were also shared by some people who attended the marriage,’’ he said.